Craftster Community > CRAFTSTER CRAFT CHALLENGES > Archive of Past Craftster Challenge Entries > CHALLENGE 12 ENTRIES > TRIPPING THE LIGHT FANTASTIC!! I USED A GLUE GUN TO ATTACH THE POMPOMS TO THE PLASTIC LACE THEN TIED IT ON THE THE MAIN BODY. Re: TRIPPING THE LIGHT FANTASTIC!! that's really cool! The colors are my favorite part, though, I just love how they go together and stand out and stuff! My fave so far! definately! I Love it! I have actually been looking for something like that....but fire safe..... to hang above my bathtub! damn! thats the best use if pipecleaners ive ever seen! very crafastic .. love it !! WOW! That is awesome! I love the colors. Maybe you could use those faux tealights that run on batteries to add some light. I can just see this in my cousins room! It just pops! Great idea. Sign up for the Craft WITH Your S.O. Swap! That is awesome -- it is so cute! Love it! I love it and want it for my room! You should win!!!! i think this would be so precious in a little girl's playhouse!! Ooohh...I need something like this over my dinner table. The title of the post doesn't happen to be an old 97's reference does it? Metrobus 2B, I want to fight you. I am having some serious pipe cleaner envy!! Awesome chandelier! thanks peeps! im really pleased with the way it turned out but the picture doesnt do it justice. not sure about the reference?? but i made my friend a candle holder years ago and gave it that title and it just seemed to good not to use again,what are these cakes thar you talk of?? they sound good. - my sister would love love love that!! Its great! what are these cakes thar you talk of?? they sound good. 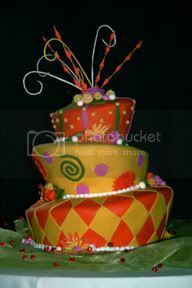 Those are examples of a Mad Hatter cake. They're really popular as wedding cakes right now. 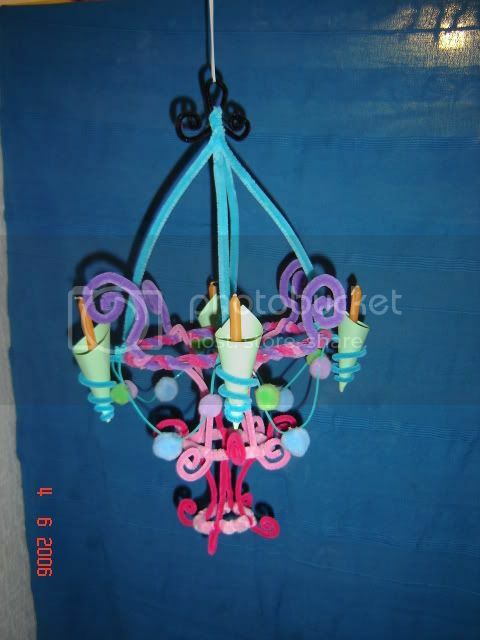 You can google image more, or try putting in "Whimsy cakes" They're pretty funky. ooo great career do you enjoy it? stupid question of course you do its like having your own fantasy weddings over and over but different every time right? or is it just huge bridzilla's demanding the moon on a stick 24/7?